Who doesn’t love butterflies? These beautiful animals capture our attention, delighting us with their delicate, fluttering, vividly-colored wings. Every fall, the Desert Botanical Garden in Phoenix, Arizona creates an amazing display of caterpillars that transform into majestic Monarch butterflies. Visitors can observe as the hungry caterpillars chow down on their favorite plants, form their "cocoons" (scientifically referred to as chrysalises), and ultimately become amazing butterflies. This year the installation is running from September 26, 2015 – November 14, 2015. Here at Evergreen Turf, we specialize in growing and installing sod – but we know how much Phoenix residents love the Arizona butterfly installation at Desert Botanical Gardens! So we put together this helpful guide with 6 ways you can attract butterflies to YOUR garden. 1. Make sure your yard / garden gets plenty of sunshine. This is usually not a problem in sunny Arizona! But did you know that butterflies usually only feed in full sunlight? It’s no wonder we associate butterflies with beautiful days. Keep your plants local. Don't import crazy flowers from China or anywhere else. Native plants work in harmony with native animals like butterflies because they have evolved together in your environment. This also goes for your grass lawn by the way. The more you stick to native grasses such as Midiron, Tifway, and St. Augustine the better chances you have at keeping your lawn alive and attracting native fauna. 3. Don't use toxic pesticides. They can kill butterflies and other helpful creatures that live in your yard. Check out our 7 Tips for Natural Garden Insect Control for more ways to keep your backyard healthy and thriving. Butterflies like to splash around in puddles of water. They also stay hydrated with water, just like us! So make sure you create a little area in your yard that has fresh water for the butterflies and you’ll be one step closer to being the coolest butterfly hangout spot in town. 5. Choose plants with good nectar sources. For a more complete list of butterfly-friendly plants, check out this list on The Old Farmer's Almanac site. 6. Choose plants with bright colors. Butterflies are attracted to colorful flowers, so if you’re not sure which plants to choose, keep this handy information in mind. If you have little ones, take them to your local nursery on your day off and have them help you pick the most colorful flowers in the store. It's a great way to spend time with your kids and they’ll have a blast knowing they are creating a home for butterflies! 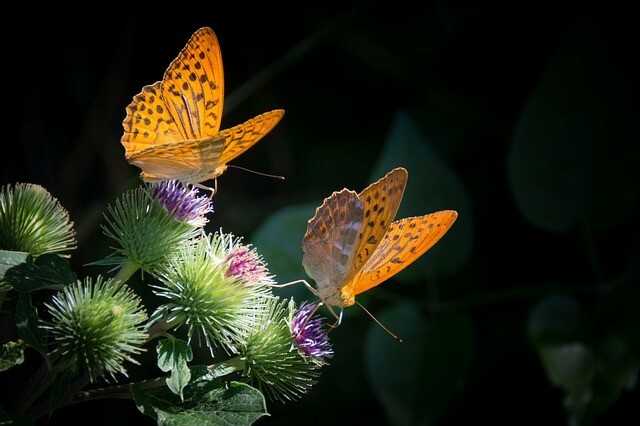 Follow these tips to attract butterflies to your garden, then sit back, relax, and watch these beautiful creatures enjoy the habitat you have created just for them.